You can check out all kinds park & trail information on our Sleeping Bear Dunes Homepage and get snow & trail condition updates at Ski Leelanau! There is no better way to get outside and burn off some of those extra holiday calories than by joining a Park Ranger at Sleeping Bear Dunes National Lakeshore on a guided snowshoe hike every Saturday. Meet at 1 p.m. at the Visitor Center in Empire for these popular weekend afternoon adventures. They take place every Saturday, starting on January 7, 2012 and going through the month of February. Dress in layers, wear waterproof boots, and don’t forget to take your camera along to capture the wonders of winter. Park Rangers meet interested snowshoers inside the Visitor Center to first provide basic snowshoeing instructions, and then directions to a trailhead or off-trail area pre-selected by the Park Ranger. If you do not have your own snowshoes, the National Park Service will loan you a pair free of charge (they are limited to 30 participants so email or call them to pre-register). 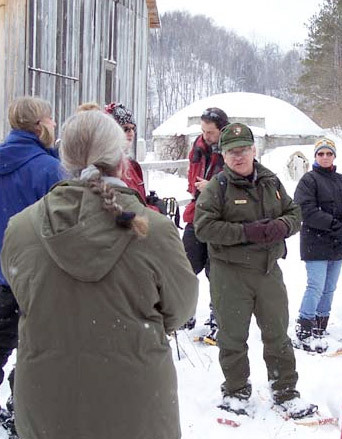 While exploring outside, the Park Ranger will encourage participants to inquire and learn about winter’s effect on the park’s unique features. Be prepared to be outside until about 3 p.m.
Not only is snowshoeing easy, fun and good exercise, it is also an activity that can be enjoyed by all ages. The Park Ranger-led hikes are mildly strenuous, yet they proceed at a leisurely pace for no more than one and a half miles. This allows visitors an opportunity for discovery, adventure, and to look for signs of wildlife or evidence of ancient glaciers. Some snowshoers simply want to experience and enjoy a winter wonderland, which is what you will find at Sleeping Bear Dunes National Lakeshore. There is no charge for the programs, however, participants need to display the park entrance pass or have an annual pass to join in the fun. Reservations are not required, but are suggested, especially if you wish to borrow snowshoes or are with a group. Please call (231) 326-5134, ext. 328, for details and to make reservations. For more in-depth information about Sleeping Bear Dunes National Lakeshore, visit www.nps.gov/slbe.